Loss and Found Video : a Video about what to do if your baby didn't pass the newborn hearing screening. Otoacoustic Emissions (OAE) - otoacoustic emissions can be tested using TOAEs - transient otoacoustic emissions - or DPOAEs - distortion product otoacoustic emissions. This test is often used as a screening measures to see if the child is hearing through the level of the cochlea, the small snail shaped part of the ear. A small probe tip is placed in the baby's ear canal. The probe sends a signal to the cochlea. If the cochlea is working the way it should a echo is measured by the probe. If the child has debris in the ear canal, fluid in the middle ear or a hearing loss an echo will not be measured. Automated Auditory Brainstem Response Evaluation (AABR) - a screening tool used for infant who have reached at least 34 weeks conceptional age until the child turns six months of age. The screening is completed similarly to the ABR however only one pitch at one loudness is presented each of the child's ears. Then the child's response is compared to a template of children with normal hearing. If the responses match the child passes the screening if the response does not match the child is referred for further testing. Can a Baby Pass the Test and Still Have Hearing Loss? 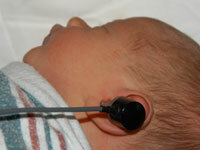 Although it is rare, a baby can pass a hearing screening and still have hearing loss. Some mild hearing losses or losses that affect only some pitches may not be picked up by the screening test. One of the earliest auditory skills to see in your baby is localization, the ability to find the source of a sound. We hear through two ears (binaurally), therefore we can localize sounds with extreme accuracy. During the first year, your baby will refine listening skills and should alert to and look for the sources of common sounds around the home, such as a ringing doorbell or telephone, slamming door, children playing, a musical toy and speech. Your child has difficulty identifying where sounds come from. Your child does not startle to loud sounds. Your child's ability to produce and understand spoken language is delayed for their age. Your child appears to not pay attention. Your child has frequent ear infections. Some babies may have hearing within normal limits at birth but a hearing loss develops over time. If your infant has risk factors for a progressive hearing loss or if you have concerns about your child's responses to sound or speech development, you should contact your baby's doctor and an audiologist.